(L-R) Australian High Commission Counsellor, Public Policy and Health Security, Will Robinson and Burnet's Dr Leanne Robinson. 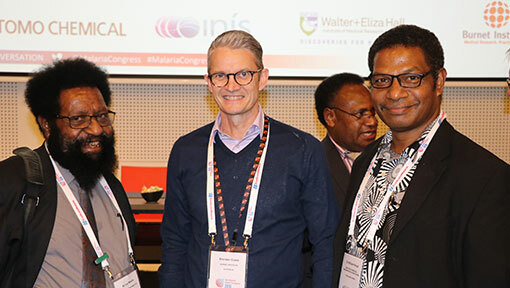 Partnerships and working together across borders to achieve effective malaria elimination has been one of the strong messages resounding from the 1st Malaria World Congress in Melbourne. 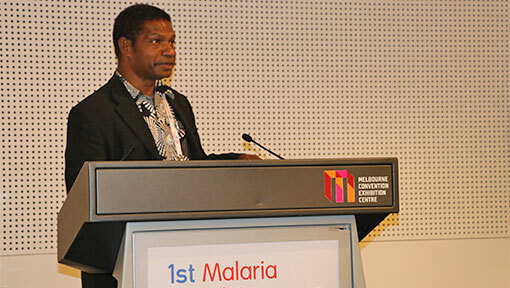 On Day 3 of the Congress the innovative Australia-China-Papua New Guinea Trilateral Malaria Project was highlighted as an example of what can be achieved working together. 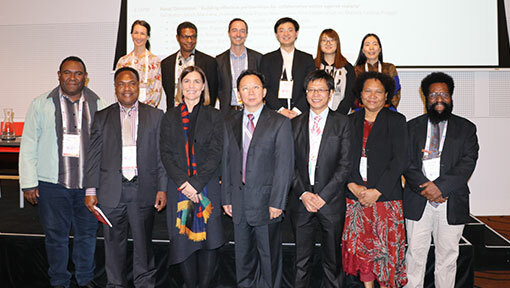 The Australia-China-Papua New Guinea Trilateral Malaria Project, funded by the Australian Government, supports leading experts from PNG, China and Australia to improve malaria diagnosis and carry out research to inform malaria policy and program decision-making. The project supports Papua New Guinea’s National Malaria Control Program that is managed by the National Department of Health (NDoH), and provides an opportunity for key institutions from all three countries to share knowledge and expertise. Image: PNGIMR Director, Dr William Pomat. Acting Director of the Papua New Guinea Institute of Medical Research (PNGIMR), Dr William Pomat updated the delegates on some of the key issues, particularly focussing on the specific training needs of staff in PNG. “Are our health workers able to change from the old ways to new ones and how scared are they?” he asked. “Many of them are older and they may find this difficult. One of our staff is undergoing training in Thailand to understand more around multidrug-resistance and point-of-care testing. “We are detecting severe malaria and symptomatic malaria at our health facilities. But its what is underneath that we are more worried about, needing active surveillance and cross-sector surveillance is important. We need to fund those to find the best way to fix a problem or use other interventions. A panel discussion “Building effective partnerships for collaboration action against malaria” included: PNG Department of Health’s Leo Makita, Papua New Guinea Institute of Medical Research, Dr Moses Laman, China’s National Institute of Parasitic Diseases Dr Junhu Chen, Burnet Institute research group head, Dr Leanne Robinson and Australian High Commission to Papua New Guinea’s Will Robinson. Image: Mr Leo Makita, Professor Brendan Crabb AC and Dr William Pomat. Head of Papua New Guinea’s National Malaria Control Program, Mr Leo Makita said: “This project is one-of-a-kind in trying to achieve some of the problems we face. We are used to bilateral and multi-national relationships but what happened with this arrangement was that it now paves the way for many of the things we would want to see being achieved in terms of the malaria program. “We have now established relationships among our own institutions (in PNG). Those relationships were not there earlier on before this project. But with this trilateral arrangement we have come to realise that getting those institutions together makes a difference in terms of delivering what we are supposed to be delivering. “When partnerships are built up it makes it possible to move forward to other areas, as well as malaria. “It is so difficult to build partnerships but it is so easy to destroy them. Burnet’s Head of Vector Borne Diseases and Tropical Public Health Group, Dr Leanne Robinson offered some sage advice to the delegates in the room about achieving success working with communities such as in PNG. “Be able to admit what you don’t know and go into discussions to find out what is the best way to go about trying to implement that project in the local context,” Dr Robinson said. “If we want new tools, new strategies, new approaches to actually have relevance and become part of a stronger health system then we need to sit down at the table and ask them what is the major barrier at the moment in this area. “Can it be addressed through the type of research expertise or technical expertise that you have? If not, at which level in the pipeline does my area of expertise best fit in. Image: Collaborators and speakers at the special MWC2018 session on the Trilateral Malaria Project. In 2017, scientists and researchers from the three countries provided training to 200 national laboratory staff and health workers in accurate use and quality assurance of malaria rapid diagnostic tests, microscopic analysis and highly sensitive molecular diagnostic techniques. The Project also supported the PNG Institute of Medical Research conduct long-term malaria surveillance at four sites around the country in order to monitor trends in malaria transmission, which helps the National Department of Health ensure people have access to early diagnosis and treatment. Nearly 95 per cent of Papua New Guinea’s population live in areas of high risk for malaria transmission. More than three-quarters of the cases in the Western Pacific Region are reported in PNG. Whilst the international community is looking to a malaria-free future by 2030, the 2017 World Malaria Report states that after an unprecedented period of success in malaria control, global progress has stalled.